President Martelly urges the leaders to work together as only well-coordinated initiatives may give convincing results. 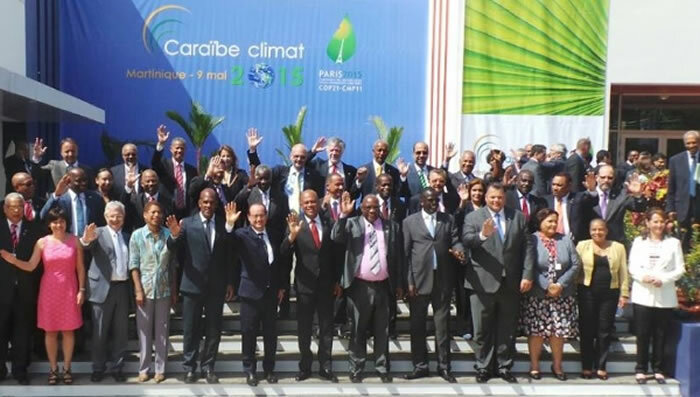 On Saturday, May 9, 2015, President Martelly accompanying the Ministers from the departments of Environment, Economy and Finance, Trade and Industry, participated in the Caribbean Climate Summit 2015, a one-day summit in Martinique's capital, Fort de France. Caribbean leaders from 13 countries had participated the summit, which was chaired by the French President Francois Hollande. It was a preparatory regional summit as the meeting gave participating leaders an opportunity to discuss a joint policy before the 21st session of the United Nations Climate Change Conference (COP21) scheduled to be held in Paris from 30 November to 15 December of this year. Dominican Prime Minister Roosevelt Skerrit, as the Chairman of the 9-member Organization of Eastern Caribbean States, has said that the summit has given the islands an opportunity to prepare so that its concerns receive due prominence in the Paris talks.